According to some people out there, May 21st 2011 (that’s today!) will mark the end of the world. To get you through this lovely day, dubbed Judgment Day, here are a few Facebook status updates that you can use. …isn’t worrying about the world coming to an end today. It’s already tomorrow in Australia. …won’t wake up for the end of the world, unless it has some spectacular special effects. If I die today, my life will never be the same again. …feels like Y2K all over again. …is looking busy (Jesus is coming). …feels fine (’cause it’s the end of the world as we know it). …is still deciding what to wear for the rapture. 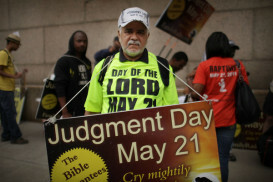 …is a proud survivor of Judgment Day 2011! We’ve also added a Proud Survivor Of Judgment Day 2011 Facebook profile header to our page. Start by tagging yourself in this picture, hit the left arrow and tag yourself again in the next one, and continue all the way to the 5th image. Or you can upload the survivor banner to your own profile using our Profile Headers app. Posted by Pieter on May 21, 2011 at 6:35 AM. Use this trackback if you're linking this story.